UP Scholarship 2019 -20 : Dear students of Uttar Pradesh, today we are giving you information about UP Scholarship Program 2019 -20 through this post. How to apply for the Uttar Pradesh Scholarships Scheme 2019, what is the eligibility for it and its complete procedure, to know everything, read this post till the end. As some of us, perhaps you may also know, students who are studying in Uttar Pradesh are given scholarship for admission in each class every year. Under the Uttar Pradesh Scholarship scheme, scholarships are given to encourage all the students and the cost of studies is given to the student through scholarships. Under the Uttar Pradesh Scholarship Scheme, not only are students given incentive but also the amount of fees charged during in any course is also paid by the government. Online application is invited for the scholarship scheme by the Uttar Pradesh government. Beneficiaries of Uttar Pradesh Scholarship scheme 2019 are those who are studying in the state, those students who are Premitric (Class 9 and Class 10), Post Metric Intermediate (Class 11 and 12), Post Metric and Other Intermediate Courses - under Graduation (BA / BSC / B) .Com / BCA / B.Tech / BBA) and other courses, Post Gradauation (MA / M.Sc./M.Tech. / MBA / M.Com.) And other Courses besides ITI, Polytechnic etc. Students of SC / ST / OBC / GEN / Minority category All are eligible for this scheme . The applicant of SC / OBC / ST category should not have annual income exceeding three lakhs from all sources of the family. The annual income from all sources of the applicant's family of the GEN category should not be more than two lakhs. To apply for UP Scholarship 2019, it is mandatory for the student to pass in the previous year's examination, Fail Candidate are not eligible for this scheme. The Applicant should have a Marksheet (Certificate) of last Year's Examination. The Applicant should have a Permanent Resident Certificate of Uttar Pradesh (Mool Nivas Prman Patra). Applicant should have Caste Certificate. There is a need for Income Certificate to Apply for UP Scholarship 2019. Applicant Should have Aadhar Card. Go to Social Welfare Department official website www.scholarship.up.nic.in. The home page of the website will open on your screen. Now click on the 'Student' link on the Home screen and click on 'New Registration' from the list. After Clicking, a New Page Will Open on your Computer Screen. 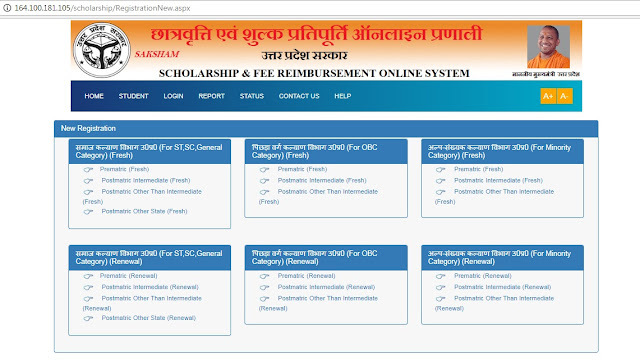 Now you have to complete your application by clicking 'Fresh' or 'Renewal' according to your category according to SC / ST / OBC and period of course. During Study In a course, in the first year to apply online for scholarship, you have to do fresh registration while in the next year you will not need fresh registration you just need renewal of your previous year registration to apply Scholarship. Go To Official Website Of Social Welfare Department of Lucknow Uttar Pardesh www.scholarship.up.nic.in. On The Home Screen of Website Select Status and click on "Application Status 2019-20" Link. You can Check Your Scholarship Application Status Just Enter Your registration number and birth date .After Filing Details click on the Search button to check the status of your application. Go to the website www.scholarship.up.nic.in. Click on Report then click on session 2019-20. Now select the category on which a new page will open in front of you - SC / ST / OBC / GEN / Minority. You can check the list of UP Scholarships 2019 online like this. if You Have some Query Regarding "UP Scholarship 2019" , Please Comment With Us. & Share This Information With Your Friends Circle If You Like This Info.